In partnership with the Museum of the Jewellery Quarter, we are inviting applications to be an Artist-in-Residence in partnership between the School of Jewellery and the Museum. The School of Jewellery will mentor the new AiR while they are based in the historic Smith and Pepper factory, using the resources there to create a collection which will be sold – with full commercial remuneration – through the Museum shop. Apply here if you are interested! 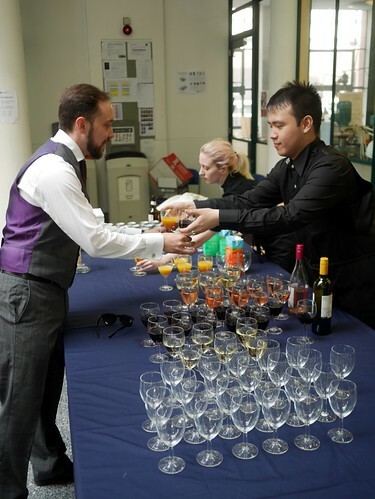 The graduate show ran for a week with two private views, one for “Friends and Family” and one for our industry partners, each having a very different character. The graduates themselves ran the first “Friends and Family” night with a band, a rather excellent bar (with sponsorship from local Purecraft Bar), and an introduction from our own starry Chancellor, Lenny Henry! Lots of proud mums and dads, grandparents, partners, siblings and friends. An excellent night all round. 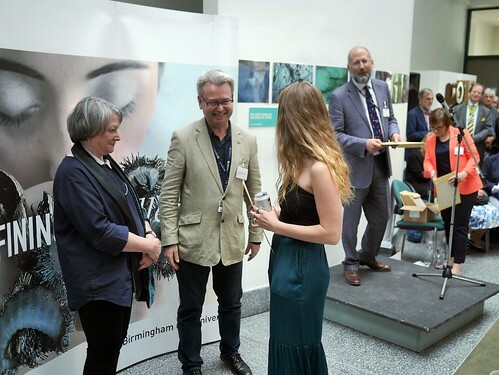 The industry night had a rather different complexion, it also being the night of our prize-giving when the jewellery, horology and gemmology trade, as well as designers and makers and supporting organisations generously give prizes for the best work in the show. Lorna McNaught being presented with a prize by Head of School, Professor Stephen Bottomley and Ellen McAdam, Director of Birmingham Museums Trust, our guest speaker for the evening. 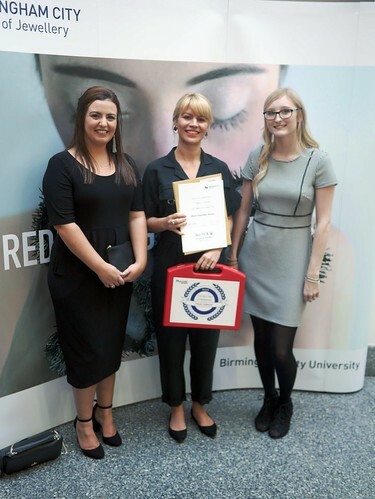 Over 42 prizes were awarded from the industry both locally and internationally, including from HS Walsh, The Birmingham Assay Office, Betts Metal Sales, Weston Beamor, The Association for Contemporary Jewellery, Regent Silversmiths, The Scottish Gemmological Association, The Birmingham And Midland Institute, Cartier, Maun Industries and many, many more. 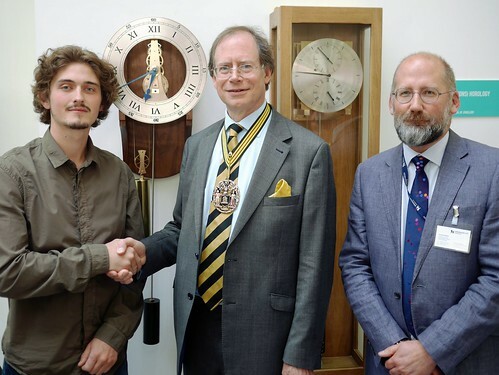 Horologist, Tyler Davies receiving a prize from the Worshipful Company of Clockmakers with Jeremy Hobbins, Course Director of the Horology Course. Hayley Volkering accepting a prize from Maun Industries. 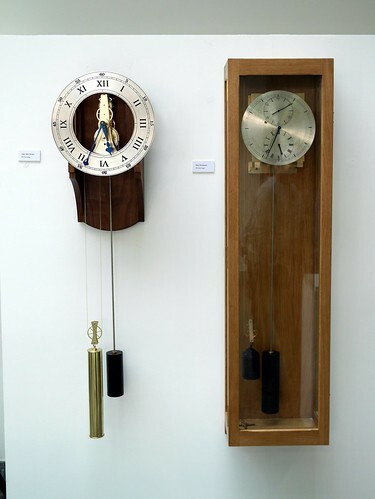 Handmade clocks by Tyler Davies (left) and Kate Thomson (right) from the BA Horology course. Work exploring “the abject” by Tilly Wright of the BA Jewellery and Object. Brooches made as part of a photographic exploration. 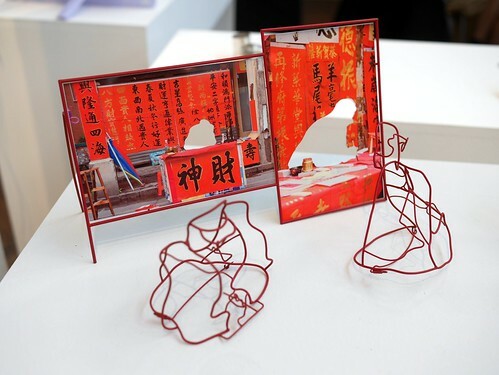 Zhixuan Liang of the BA Jewellery and Object. Silver salt-and-pepper shakers by George Harrow of the HND Jewellery and Silversmithing. 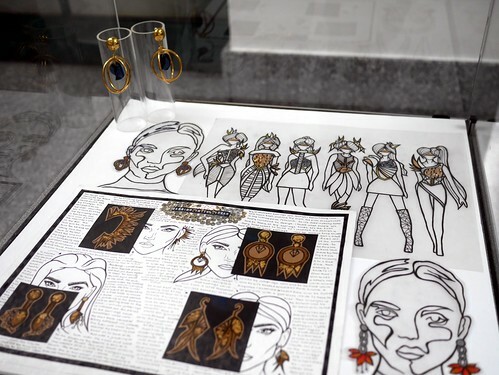 Sketchbook work for fashion jewellery by Erica Laver. HND Jewellery and Silversmithing. Objects by Jiru Weng. 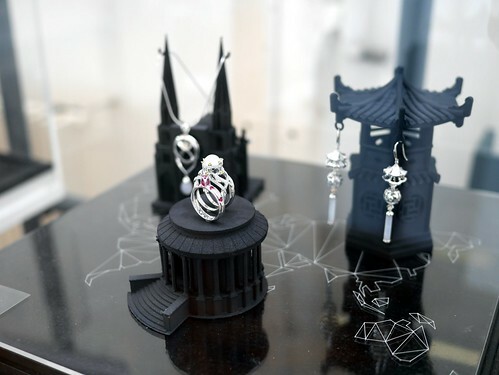 BA Jewellery and Object. 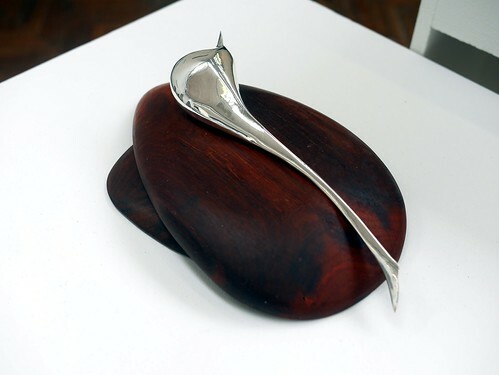 Silver and wood object by He Fei. BA Jewellery and Object. Wearable object work by Lanyue Zhang. Graduate Certificate Jewellery and Related Products. Fine jewellery work by Andrew Cowley. BA Jewellery and Silversmithing Design For Industry. Fine jewellery work by Hon Chun. BA Jewellery and Silversmithing Design For Industry. Jewellery by Elinn Yi Fang. BA Jewellery and Object. 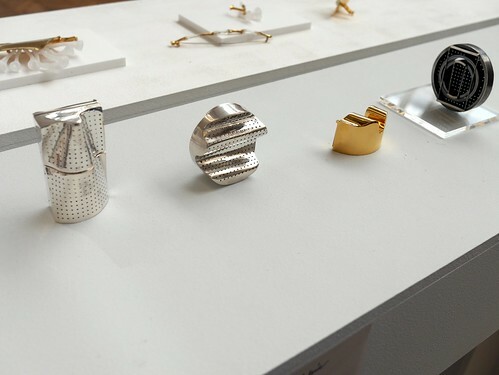 Images courtesy of Dauvit Alexander – School of Jewellery – Birmingham City University. 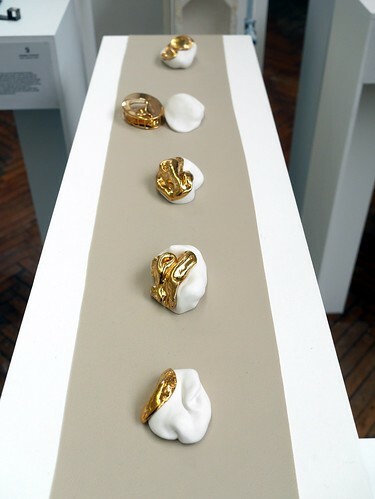 We are delighted to host Transitions an exhibition of work by the School of Jewellery’s Artists in Residence. We would like to invite you to join us on Tuesday 24th April from 6 – 8pm to celebrate their collective achievements. The School of Jewellery Artist in Residence mentoring scheme runs for a full academic year. It offers access to the School of Jewellery’s outstanding facilities for the duration of the residency, in exchange for student support one day per week. It is a fantastic opportunity to develop new work and technical skills in a creative environment, through collaboration with the AiR team and opportunity to engage with the rich and vibrant Jewellery Quarter community. What lies beneath is the subterranean. It’s the dark, the buried, the out of sight. In their individual ways each of the members of Subterranea is engaged with the buried, the stuff that lies beneath, be it literally or metaphorically. Subterranea is an ongoing collaborative conversation between Nuala Clooney, Rachel Darbourne, Bridie Lander and Drew Markou. Together they explore the overlapping processes and shared research territory in their individual practices. Alongside displaying work the artists explore how to reveal the usually hidden conversations and processes of both the individual creative journeys and the development of the collaborative practice. The audience is invited to participate in the opening and closing events and engage with the work. Interaction by audience, participants and the artists throughout the time of the exhibition will result in a continual evolution of the space, encouraging new narratives and interpretations. Rather than seeking to show a concluded body of work, the show puts emphasis on the process, the journey, revealing the normally unseen side of an artists’ practice and so poses the question is anything ever finished? Subterranea invite you to take part in their opening event on Thursday 22nd March 6 – 8pm. This performative and edible event explores the notion of a surface as a continuous being with neither inside or outside. During the evening, biting, chewing and consuming, normally a private activity that takes place inside the mouth’s cavity, becomes externalised and public. Performing bodies and tools taking on the role of the mouth as they bite into a table consisting of a pink mucous membrane. The audience will be served sweet mouthfuls of this continuous surface, a surface that becomes’ passed on and into others and has a new form of existence. The resulting piece will become a new video work that will then be projected onto the remaining table throughout the course of the exhibition. Join Subterranea for an intimate and interactive walk around the exhibition with the artists. We seek to provide you with a deeper sensory and tactile experience of the work on show by offering you an opportunity to taste and consume a selection of edible, sumptuous and sweet morsels, each inspired by the artists’ work. Rachel Darbourne taps into our childish affections and the recesses and transgressions that may linger there. The familiar cuddly toys, the transitional objects are distorted and transmuted into uncanny, titillating tactile furries that tickle at the boundaries of innocence and other – the stuff that lies just below consciousness. 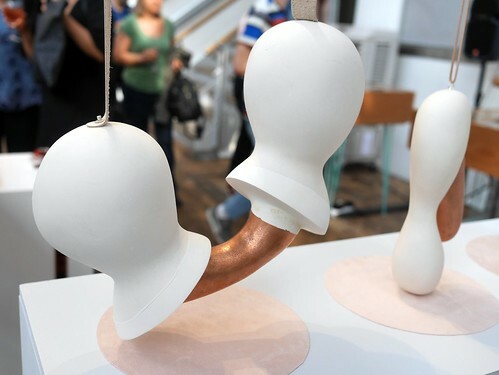 Rachel is a maker, what she makes reflects her perceptions of and confusions about the world, the people in it, the politics, the psychology, the philosophy, and the seemingly existential predisposition to violence. 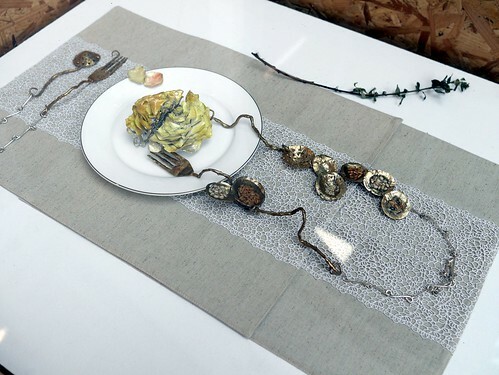 She is Pathway Leader for Jewellery at Plymouth College of Art. Nuala Clooney is a cross disciplinary artist who boldly recasts the body, her body, creating part body, part objects that lie in the space of self and other. She explores the sensuous fluids that interplay and intermingle self and other, the dark viscous spaces between felt and feeling. 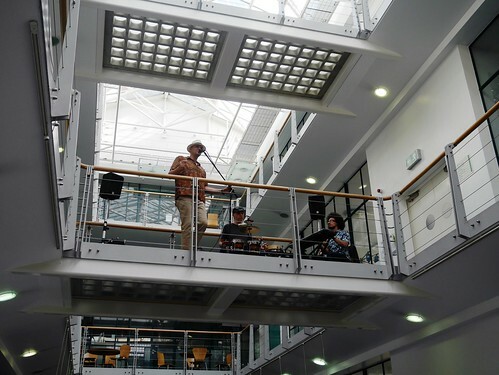 Nuala is currently undertaking a year-long residency at Grand Union Birmingham developing the experiential and performative aspects of her practice. 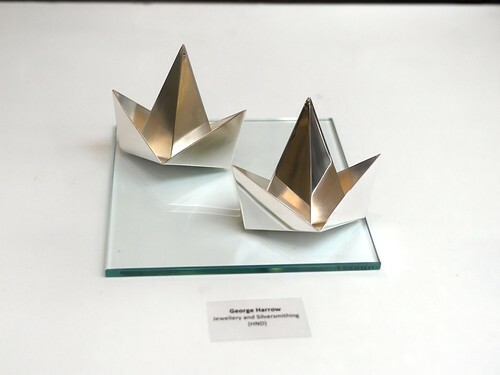 Alongside her studio practice, Nuala works in collaboration with other artists. Current projects include ‘Expanded Intimacy’ developed with Kaye Winwood and a new film collaboration with Tereza Stehlikova. Drew Markou creates forms that at once look futuristic and archaeological artefacts, unlocked from the earth they were cast in. While his process is methodical the outcomes rely on a certain happenstance, a synchronistic event and the final outcome enticingly unpredictable until they are revealed after the sand-casting process. The resulting artefacts aim to explore notions of belonging, purpose and existence. Drew is a lecturer based at Birmingham School of Jewellery. His current research seeks to examine the synonymic links between creation within religion and that within his own studio practice. Bridie Lander through the use of black, black glass mirror, black enamel, and a menagerie of other material hints at the mystic; the alchemistic; the dark arts. The black reflective surfaces play with the parallels of the ubiquitous black glass of our mediated technological times with the notions of scrying or Claude glass. Bridie is a senior lecturer at the School of Jewellery interested in the effect of digital technology on material culture, she draws analogies between studio practice and alchemic process. In my previous blog, I mused about how to provide opportunities to get lost and enjoy the process within the MA that I’m leading at the School of Jewellery. The answer (one of the answers, anyway) is life drawing, it seems. This was the first of a series of drawing activities across a number of schools, to encourage students to venture out of their home campuses and get to know peers from elsewhere in the faculty. My contribution was a life(-ish) drawing session on body extensions, held at the School of Jewellery on Wed 11 Oct. Taking our cue from Rebecca Horn’s 1970s work, we started off by restricting the parts of the body that permit us the most control over our movements and the marks we make: after a quick warm-up, we drew with non-writing hands, and then with no hands at all. There was plenty of giggling at this stage, as students used mouths, feet and crooks of arms to produce drawings that were surprisingly recognisable as me, the sitter. Left to right: drawing with the mouth (Xingxing), feet (Tilly) and I honestly don’t know what, but I love the speculative nature of the lines! All that was left, at this point, was to introduce the students to the range of materials I’d brought to the session: drawing media (including charcoal, marker pens, ink pens, pencils, chalk),A1 paper, poster paint, garden canes, lining paper, elastic bands, string, straws, balloons, disposable overalls and wooden skewers. The focus turned to exploring the movements that can be made with parts of the body that might usually sit below the level of conscious awareness, parts of the body that you have to find other ways to pull into focus and documenting these movements with a range of media and approaches. Elsewhere, some of those present adopted quite a meditative approach, spending much of the remaining hour with the same media and the same tools. Left to right: drawing with straws; bouncing a ball of string dipped in poster paints from a chain of rubber bands; rolling a straw/skewer dipped in paint. Tilly threw herself into the session, and made a number of drawings with some really sensitive marks. I had a play with a handful of ink pens held on my fingers with rubber bands (until they went blue! ), creating a negative image of an intriguing, scissor-like clamp. Left to right: drawing with feet, and mouth/string/chalk; negative drawing with pen/ink. The feedback about the session was fantastic: ‘mind-blowing!’, ‘pushed us to try new ways of drawing’, ‘a beginning for me’. My favourite comment was from a participant who said, rather poignantly, ‘I was able to experiment more freely than I usually do, without fear’; I like to think that the open-ended, messy, exploratory nature of the session created a space in which students could get lost in playful making and drawing. Drawing with chalk and (improvised) chopsticks (Elizabeth). Many thanks to all those who took part. Here’s to the next one! Drawing with eyes closed (Yiji). I was persuaded to attend the first day of the Flux conference by my colleague, Kate Thorley (Programme Leader of the new BA(Hons) International Jewellery Business course that opens its doors in September). I was taken by surprise by the passion and enthusiasm of the organisers and many of the delegates, and I felt like a complete Luddite for much of the day. Here’re my reflections on what I saw and heard. The opening session was a keynote from Harriet Kelsall about the different circles of practice that jewellers work within. It was interesting for me to see the incremental steps that she has engaged in over the 10 years been in business, gradually building the ethical/sustainable element of business, while still maintaining options for customers who don’t want to/don’t have the budget to go full Fair Trade. She’s clearly held in some regard by the business community (she is on the board of the National Association of Jewellers, and is helping to shape its Better Business group), but she is prickly in her reference to the HE sector. She’s obviously had poor experiences with jewellery graduates (she questions their basic bench skills, and their ability to work with the public), but her criticism has a sweeping quality that sets me on edge: I think – thanks to some pertinent comments from Kate, and some active networking – we set the audience straight about the School of Jewellery’s commitment to our graduates. The session before lunch was a panel discussion on the jewellery supply chain, chaired by jewellery journalist, Rachel Taylor. Five members of the panel reflected the different stages of the chain: mineral extraction (Gold from Columbia and gems from Sri Lanka), bullion dealing and manufacturing, to goldsmithing and jewellery production. A couple of points really struck me, here. The first was from Anna Loucah, who – in challenging the perceived value of ethical products – said ‘That’s just the way it is; it’s not a premium – it’s the right price’. This references the dark art of pricing, and the fact that – with luxury bespoke products – the higher cost of ethically sourced metal is absorbed into the accumulated costs of the product as a whole; the skill is being able to communicate this to the customer in a way that they can buy into. The second theme that really chimed with me was the panel members’ responses to the question – posed by Rachel: ‘what are the obstacles that stand in your way?’ Marcin Piersiak, of the Columbian Alliance for Responsible Mining, said – perhaps unsurprisingly – it’s the actions of governments that represent the biggest obstacle to business. Pete Crump, of Vipa Designs, said his biggest obstacle was the continuity of supply; not being able to guarantee supply of products to the jewellers that buy from him is a key issue. Arabel Lebrusan felt that receiving negative feedback from suppliers and others in the trade was the key obstacle (‘how much better to have a conversation?’), and Anna Loucah felt that the provision of specific components (tube, chain, etc – in fairtrade materials) was key. Lastly, Stuart Pool (Nineteen48) identified the lack of a code of practice for the sourcing and processing of coloured gemstones as an obstacle, a theme that recurred throughout day one of the conference. Jon Dibben, getting almost as sidetracked and distracted as me! The breakout session after lunch was fascinating (and hilarious!). This was a lively discussion between Tim Ingle (Ingle and Rhode), Jon Dibben (Jon Dibben – Jewellery Design) and Sam Rose (September Rose), chaired by Jane. The discussion ranged around the issues of how ethical business can be made to work in the round. Sam’s point, here, about the danger of making it seem that all the problems had been solved – through the use of ‘badges’ such as FairTrade and FairMined – was an apposite one. Her approach is to work, on occasion, with pre-certified/up-and-coming mines, in order to create the maximum benefits for all concerned. 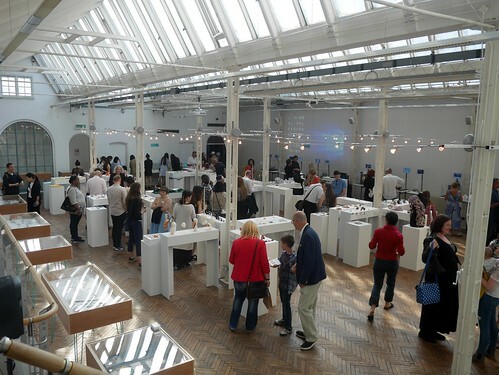 In addition, the jewellers highlighted some of the tensions that existed in their business – establishing the right balance between creating demand, and being preachy or evangelical; being niche and shifting into the mainstream – and the focus came to rest on the need to raise awareness of the issues, without focusing (to the point that would be off-putting to customers) on the grimness of the situation for the worst affected. It’s a tough call, for those so invested in their cause. Lastly, the session from Sarah Greenaway (of jewellery brand, Mosami) and Liz Tinlin (of brand strategist, Blue Babel) was really enlightening. The focus on their talk was on trust and truth, and this drew into sharp relief my own prejudice regarding the role of business in general. The notion that ethics in business is problematic (because of its overtones of moral judgement, and because of the religious framework that it might imply) is one I can get behind; however, the idea that business scores more highly on the Edelman Trust Barometer is something that challenged my thinking. Liz made the point that ethical business can maintain its place at the leading edge, and that the rest of the market will want to catch it up, generating real change in the market. She outlined the demographic of Globescan’s ‘Aspirationals’ who are interested in, both – to cut a long story short – shopping and values. There was some discussion around their values – abundance without waste; be truly as you are; get closer; all of it; do some good – which sounded, well, not exactly like empty slogans, but the researcher in me wanted to know about the methodology used (more info about this, here). However, Liz and Sarah’s point about the need to develop a brand that reflects the values of the person at the heart of it was more resonant for me. Placing this purpose at the heart of the business means that it can inform all aspects of the business: its values, its competencies and its sense of who its customers are. In this way, the values become the ‘driveshaft’ of the business, generating value and, ultimately, profit. Far from being an ‘Aspirational’, I struggle to fit myself into Globescan’s analysis as I feel capitalism needs much more radical change than is encompassed here; at best, I’m an ‘Advocate’ (interested in social value, if not shopping – actually, I’m interested in what jewellery means, and in its ability to facilitate the individual wearer’s performance of identity). 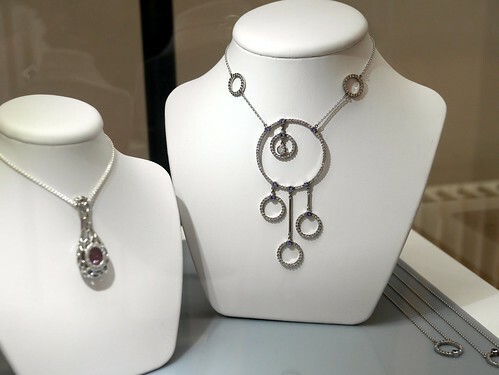 However, let’s not be too fatalistic here: this focus is helping to shift the balance away from harmful profiteering; it is also enriching the stories that jewellery is uniquely placed to tell, beginning with the authentic (truthful?) experience of the maker (and, beyond them, the suppliers of components, metals, gems, etc). It was an inspiring talk from Sarah and Liz (all the more so for having snook past my inherent distrust of marketing-speak! ), and I’m looking forward to seeing them speak at the School of Jewellery, as Kate has recruited them to deliver a session with her BA(Hons) International Jewellery Business students next year. I had to scarper at this point, and wasn’t able to join in the evening drinks (or, indeed, the second day of the conference). It was a fascinating day, in which I learnt loads about the different motivations that drive the ethical jewellery business, and in which my faith in business as a driver of social change was massively shored up. Thank you to the Flux organisers, to Kate for bullying me into going with her, and to all the delegates who made me feel welcome, despite my early scepticism. I’ll certainly be back next year.